Make learning come alive with programs from the SM&NC! The Stamford Museum & Nature Center is an excellent educational resource for schools and groups. Our four foci— nature, agriculture, astronomy and art— allow for an extensive variety of educational options. Our varied site creates an unparalled experience for your field trip! Our programs are hands-on, interactive, relevant and fun! All programs are correlated to state standards and curricula can be adapted to fit specific needs. Summer On-site Group Visits - visit the SM&NC with your camp or group! Our on-site school programs are designed to enhance your school's curriculum by providing interactive learning experiences. The SM&NC offers fun, hands-on exploration of the world — whether it is art, farm, science, nature, or history — we have it all. 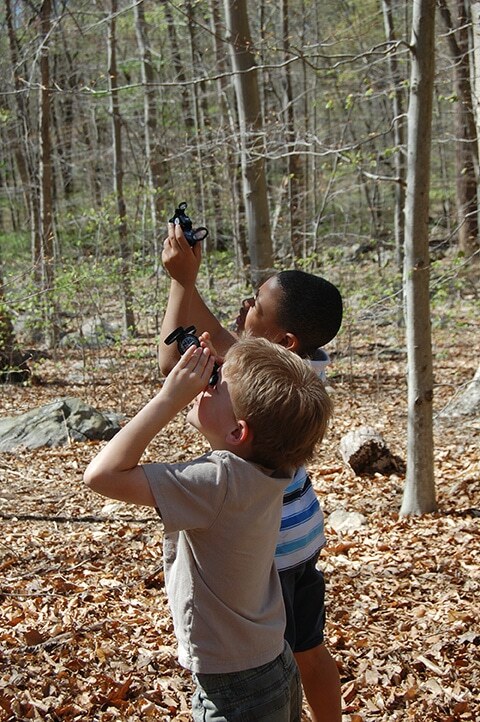 Our engaging facilities include: an educational farm; nature center; museum galleries; observatory and planetarium with research telescope; lakeside picnic area; unique Nature's Playground; Heckscher WILD! live animal exhibit, and an 80-acre hardwood forest with miles of trails. Our SM&NC in the Schools Outreach Programs are designed to provide in-class, hands-on programming for groups that cannot travel to the museum or that would like additional program experiences in-school. Have a goat, chinchilla, or lizard visit your classroom, travel 600 years in the past to discover Woodland Indian life, create a map of Connecticut, explore the three rock types, and more!